The UW-Green Bay Office of the Chancellor sent the following e-mail message from Chancellor Gary Miller to the campus community on Thursday, October 12, 2017. To say that we’re at the tail end of a big week is an understatement. It started with a visit from the Higher Learning Commission, a reflective process on where we are as an institution of higher education, and is ending with an announcement from the UW System that could significantly and positively impact the trajectory of UW-Green Bay. It’s important that we end such a big week on a note of gratitude and celebration. I can’t thank all of you enough for the countless hours you put forward to prepare for and conduct the 10-year site visit. It’s extremely gratifying to see and hear so many of you represent your campus, your colleagues and your teaching with such great pride and passion. I also want to specifically recognize a campus leader who has been living and breathing accreditation for the last year and a half. A great visit can only happen with great leadership. For that, I hope you will join me in thanking and congratulating Clif Ganyard for his exceptional work in guiding us through this process. Your University and community are grateful for your expertise and leadership. We are gathering tomorrow afternoon, Friday, October 13 from 4-5 p.m. in the Phoenix Club for a complimentary ice cream social to celebrate your work. I hope you can join us. Congratulations again on a job well done and bringing this multi-year process to a close. 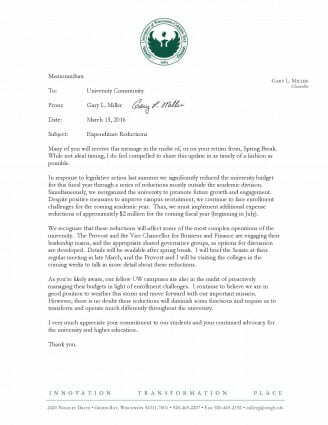 Tuesday, March 15, 2016 the UW-Green Bay Office of the Chancellor e-mailed the following memorandum from Chancellor Miller to faculty and staff regarding expenditure reductions in the coming fiscal year. UW-Green Bay Chancellor Gary Miller e-mailed the following message to faculty and staff on Thursday, February 12, 2016. Excellence in academics is at the core of what we do as a university, and we will be emphasizing that commitment at the women’s basketball game on Thursday, February 11 at the Kress Events Center. We will be recognizing the many student-athletes who have earned a GPA of 3.5 or better in the spring or fall 2015 during a halftime ceremony. To help honor these student-athletes and thank those who contribute to their academic success, I join Athletics Director Mary Ellen Gillespie and the entire Athletics Department in inviting you – UW-Green Bay faculty and staff – to attend the game as guests of the Athletics Department. The Athletics Department will provide a ticket free of charge for you and a guest. Additional tickets can also be purchased for $10. Our student-athletes’ success is made possible because of what you do for all of our students. That is why we will be recognizing all faculty and staff colleagues in attendance during a pre-game announcement prior to the national anthem. Tickets ordered by Tuesday, February 9th, will be mailed via campus mail. Orders received after that date will be held at will call. On behalf of the University of Wisconsin-Green Bay, Chancellor Gary L. Miller cordially invites the campus community to a special presentation of Emeritus and Service Awards on Thursday, February 11 from 4 to 4:45 p.m. in Phoenix Room A/B of the University Union. Time: 4 to 4:45 p.m.
UW-Green Bay Chancellor Gary Miller e-mailed the following message to faculty and staff on Tuesday, January 12, 2016. I hope each of you had a wonderful winter break. Welcome back to campus to begin the spring semester. 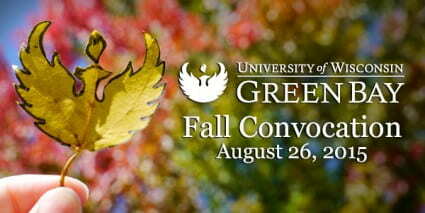 I wanted to let you know that we will not be convening for a Mid-Year Convocation this year. We are currently planning a concluding 50th year anniversary celebration for the campus this spring..
We are making plans to recognize service milestones and retirements in another format. UW-Green Bay Chancellor Gary Miller e-mailed the following message to faculty and staff on Monday, January 11, 2016. I am attaching a copy of Dr. Harvey Kaye’s very inspirational Commencement Address to our winter graduates. I want to thank Harvey for his important message to our graduates and for his commitment to UWGB. The Fall 2015 Employee Convocation kicks off the academic year at 10 a.m. Wednesday, August 26, in the University Union’s Phoenix Room. I wish to announce that Dr. Stephen Fritz has resigned as Provost and Vice Chancellor for Academic Affairs effectively immediately. I want to express my gratitude to Dr. Fritz for his work during this difficult transition. I have appointed Dr. Greg Davis to the position of Interim Provost. Dr. Davis will begin his new role immediately and will serve for and indeterminate term. I very much appreciate Dr. Davis’ willingness to accept this critical role as we complete the budget reduction process and look forward to an exciting 50th anniversary year. President Ray Cross will visit the UWGB campus on Tuesday, March 24th to meet with students, faculty and staff to listen to concerns and hear suggestions regarding the budget and other matters of importance to you. He will also bring the latest news about the System. He will hold two Town Hall meetings. The student Town Hall meeting will at 11:30 a.m. and the faculty and staff Town Hall meeting will be at 1:30 p.m. Both meetings will be held in University Theatre. This is an important opportunity. I hope many of you will join President Cross on Tuesday.